Finding the best fishing hole is now just a few taps away. Fishidy, Inc., offers a location-based social networking app that keeps tabs on well-stocked waterways and helps anglers avoid unproductive waters by heading right to the action. Used by more than 750,000 people for saltwater, freshwater, and stream fishing throughout the United States, the Fishidy app features interactive mapping technology, accurate fishing maps, and a social network to help anglers of all abilities maximize their fishing potential. With Fishidy, users can find and share their local fishing hot spots, stay up-to-date with the latest fishing reports, and track where they catch fish. Working with Esri partner GeoDecisions and Fishing Hot Spots (the industry leader in researching and making fishing maps), Fishidy’s developers created the app for the Android and iOS platforms. 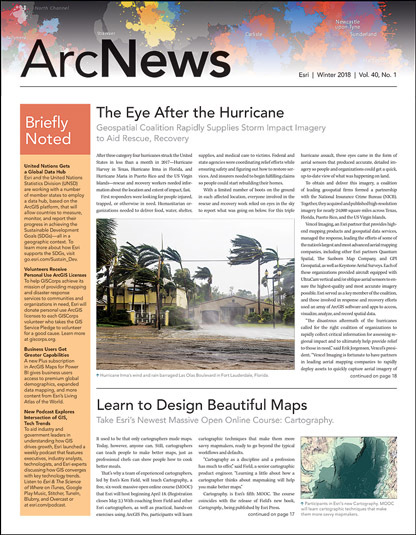 Using basemaps from ArcGIS Online, ArcGIS Runtime SDKs for Android and iOS, and Esri’s World Geocoding Service, Fishidy’s developers made sure that users could customize their searches and find specific waterways or points of interest within a default radius of their device’s current location. The app also provides users with directions to the places of interest they have selected, and the ArcGIS Android Geometry Engine API (which is part of ArcGIS Runtime SDK for Android) sorts the list of places based on their distance and bearing from the device’s location. With this functionality, users can discover and share their local fishing hot spots, stay up-to-date with the latest fishing reports, be better prepared by having detailed information about various waterways (such as large rocks, depth contours, bathymetry, and types of bottom composition) at hand, and track not only where they caught fish but also where they prefer to position their boats along waterways’ depth contours. In addition, users can follow certain waterways (like a Twitter user would follow another account) to connect with other fishermen who are interested in the same lakes, rivers, streams, and coastal saltwater areas. Following various waterways also allows users to easily see local fishing reports from expert fishing guides or avid anglers who frequent the area, contour maps, current weather, moon cycles, and water depths. 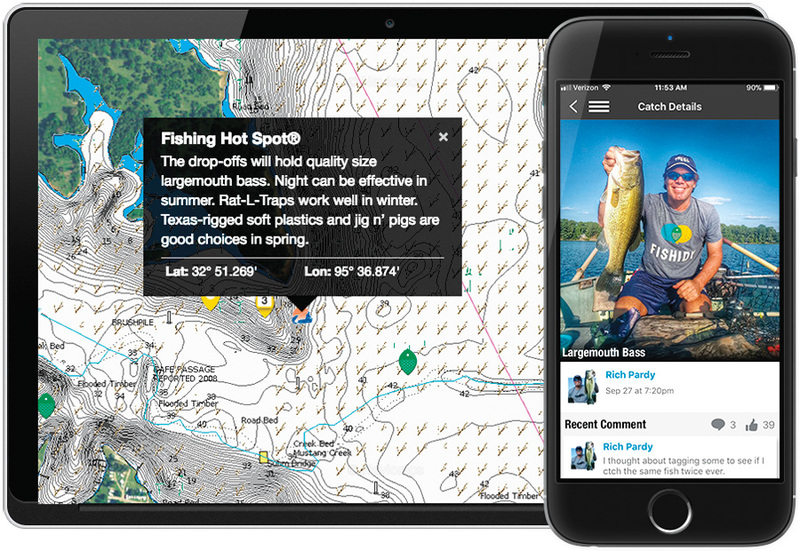 In the app’s Catches section, users can store photos of the fish they’ve caught and record the species, where they caught it, and which tackle or bait they used. Fishidy users can also connect directly with other users and view their catches; ask them questions; and get to know their favorite waterways, fish species, and gear. The maps on Fishidy—such as this one from the Sam Rayburn Reservoir in East Texas—are dynamic and interactive. The app can provide all this data in real time or forecast the weather, tides, and potential hot spots up to a year in advance. All this is made possible by ArcGIS Enterprise, which Fishidy employs not only for its data management, storage, and geoprocessing capabilities but also for its ability to identify and query data and create dynamic caches. Anyone can sign up for a free Fishidy account, though the startup also offers a premium version of the app that provides users with direct access to detailed maps and waterway information from Fishing Hot Spots. This includes hot spots that the company has field verified; digitized drawings that detail shorelines and depth contours; and icons that identify boat landings, marinas, flooded timber, weed beds, and other types of underwater structures that attract certain fish. By keeping track of fishing conditions for thousands of bodies of water throughout the United States, Fishidy is ensuring that all types of fishing—from conventional fresh- and saltwater angling to fly fishing—are more accessible. Perhaps it can encourage more people to go out and try the sport. The Esri Startup Program gives emerging businesses an edge by helping them integrate spatial functionality into their products and services. Program participants receive ArcGIS platform technology, training, support, and marketing opportunities to help them succeed. Learn more about the Esri Startup Program.